S&W MODEL 53-2 IN .22 REMINGTON JET WITH 8 3/8 INCH BARREL, BUSHNELL SCOPE AND BASE, HUNTER LEATHER HOLSTER AND 5 BOXS OF FACTORY ORIGINAL REMINGTON AMMUNITON. Description: Scarce & Desirable S&W M53-2 K-Frame Revolver with 8 3/8 inch barrel, chambered for the “.22 Magnum” in .22 LR & .22 Remington Jet calibers and topped with a correct Bushnell base & a Bushnell Magnum Phantom 1.3X long-eye relief Scope. 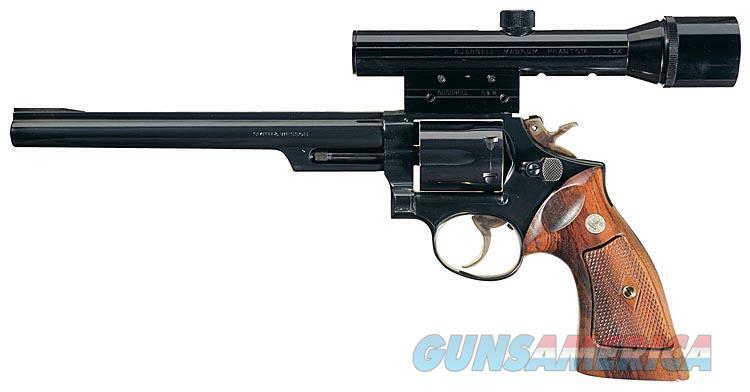 S&W produced the K-framed Model 53 .22 Magnum revolvers between 1961 - 1974. Based on the serial number, 4K48606, we believe this example to be from the last production year, 1974. The Model 53 was a single action/double action revolver designed to accommodate both the .22 LR (with the use of either a separate cylinder or with inserts) and the .22 Remington Jet cartridges. The .22 Remington Jet was developed jointly by Remington and S&W using a .357 magnum as the parent case and a .222 inch bullet. Muzzle velocity with a 40 grain bullet was reported to approach 2460 FPS with factory test loads. Actual realized performance with the 8 3/8 inch barrel is closer to 2000 FPS. The .22 Remington Jet is relatively simple to reload using either original Remington brass or .357 magnum brass. To provide for low mounting and clear line of sight through the Bushnell Magnum Phantom scope, the front and rear sights are removed on this example. The Phantom Scope has a fine crosshair reticle. The optics are clear. The exit pupil is designed to accommodate viewing from 6 inches to 21 inches. The scope features micrometer reticle adjustments. Bushnell dust caps. The left side of the barrel is marked “Smith & Wesson”. The right sideplate has the large “S&W” logo. The right side of barrel is marked “22 MAGNUM”. The right side of the frame is marked with the four line Marcas Registradas address. The yoke cut is marked “4K48606” and “MOD.53-2”. The yoke is marked “92878” and over stamped “A1O”. The bottom of the grip frame repeats the serial “4K48606”. The left side of the grip frame is marked with the number “92878”, large alpha-numeric “A1O”,”A1”, “06” . On the right side of the grip frame is the letter “L” inside a triangle, the letter “P” in a circle and what appears to be a small “x”. The bore is bright, smooth and the rifling sharp and deep. This firearm has light marks from firing and a light imprint on the recoil shield and firing pin bushing. The bore rates an Excellent. This collectible handgun has the case colored, deeply checkered, .400” semi-target hammer and the case colored, wide, polished trigger. Double action is smooth and definite, and single action break is light with no discernible creep. Frame mounted trigger stop is in place. Cylinder lockup is tight with minimum play. Action functions correctly. Barrel is pinned. We did not test fire this revolver. This Jet is manufactured with dual, “switchable” frame mounted firing pins for either centerfire or rimfire function. Fitted with checkered walnut or coco-bola grips with silver S&W medallions. Includes a Hunter Model 1100R oiled brown leather holster with soft suede interior and Hunter snap hold down strap. This M53 comes with 5 boxes of factory original Remington 40 grain ammunition in the green and yellow box configuration. Overall condition of this package is Very Good to Excellent: the revolver at 97-98% with original blue finish, light areas of edge wear, a drag line on the cylinder, a tiny dimple on one cylinder arc (see photo) and general handling marks; the holster has seen some carry use but appears to have been stored more than used and has no damage; the scope appears new; the scope mount has one small ding on left side as shown in the photo. The grips are excellent with some light handling marks. Mechanically excellent. In our opinion, this package was put together, fired some few times, cleaned and put away ... waiting for you to claim it. These guns have tremendous value for any serious Smith & Wesson collector and have great appeal to varmint hunters and those who enjoy owning and shooting something different than a .22LR or .22 WMR. Highly desirable & collectible in 83/8 inch barrel configuration.